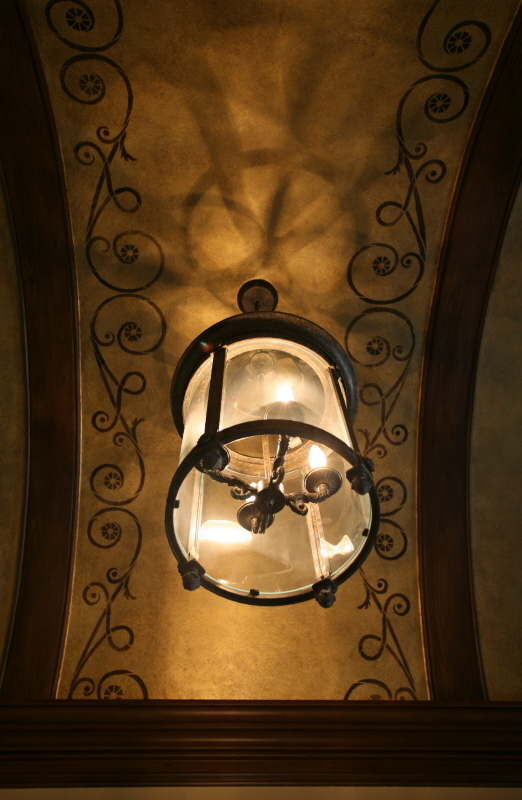 Many times, curved architectural details can be presented at their best when enhanced by decorative finishes. 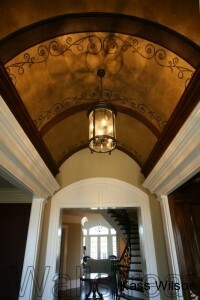 Archways and ceilings are especially challenging from a construction perspective. Chances are, anything that is not a straight line will be more labor intensive and therefore, more expensive. Beautiful curves and arches are often understated when allowed to remain white. They lack definition and are barely noticed as they blend into the trim. It is time to dress it up and make it outstanding! 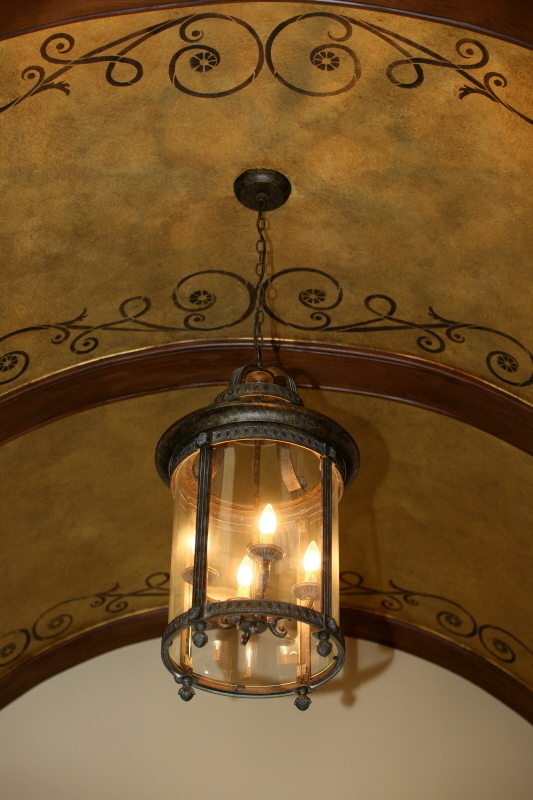 This barrel ceiling was a perfect opportunity to utilize creative faux finish techniques to bring out the finest details of this architecture. It draws attention to the quality craftsmanship that has been incorporated into the features of this home. 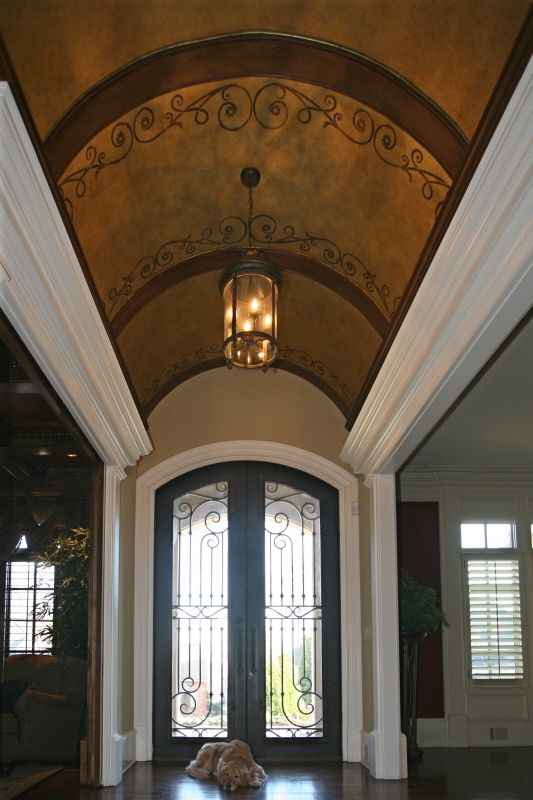 The foyer has been transformed into an intriguing grand entrance with plenty of drama and “curve appeal”. For the faux finish on the ceiling, multiple tones of golden metallics were chosen to blend with the elegant fabrics in the adjacent dining room. On the other side of this foyer is a gentleman’s study. It is completely lined with intricate judge’s paneling. 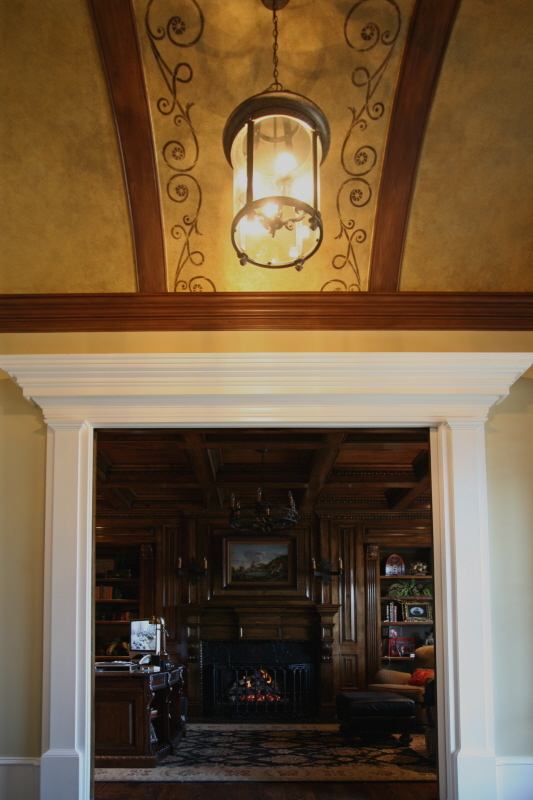 The outline of the trim on the barrel ceiling was treated with a wood graining technique to continue the rich wood tones of that room. 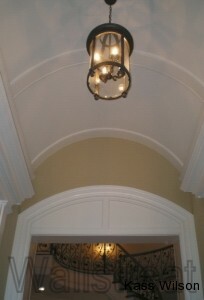 You would never guess the trim in the foyer is a decorative paint treatment rather than exquisite stain grade wood. 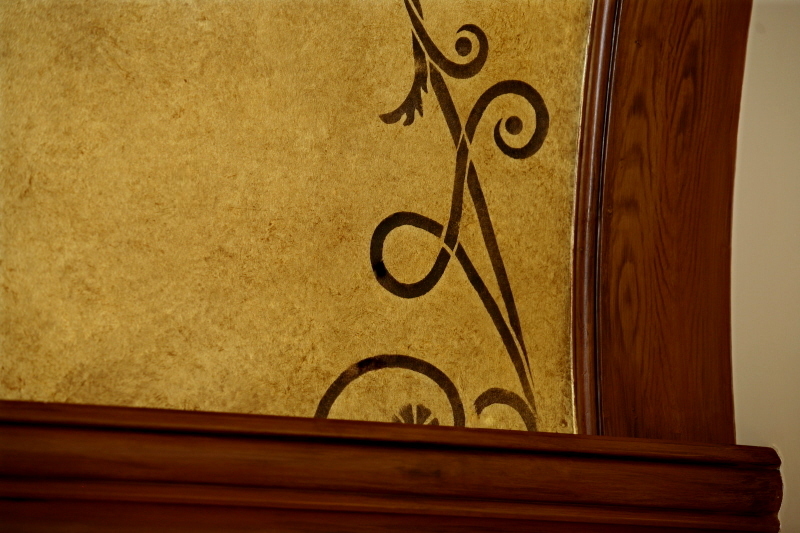 The artistry of a custom design offers an additional and unexpected embellishment. Look closely at how consistent it is with the graceful iron work in the doors and stairway. This outline acts to further emphasize the curves and archways throughout the rest of the home. 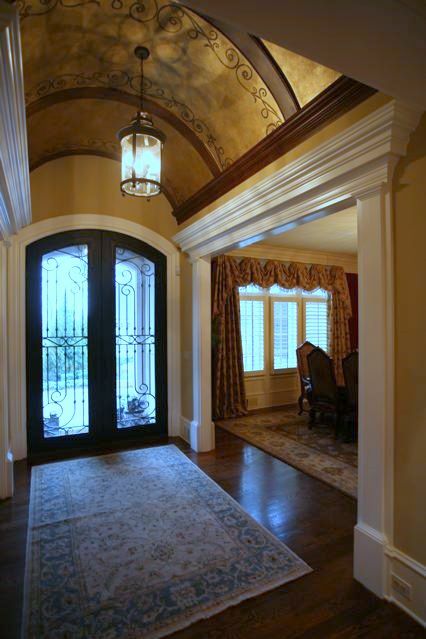 This ceiling now showcases the beautiful architectural details that adorn this space. It welcomes you with a statement of quality the moment you enter. You are immediately introduced to the soft curves that will gently invite you to relax and enjoy. The careful attention to every detail gives this home “curve appeal”. This project was designed by Joann and Kelly of Kandrac & Kole Interior Designs. www.kandrac-kole.com To view more decorative painting transformations by Kass Wilson of Wallstreat, visit www.kasswilson.com. OMG! That is so BEAUTIFUL! I love it! I love the dark trim around the design. it really sets it off. Kass, you are so blessed with talent! GORGEOUS!!! You keep on topping yourself!